Urban Heating has a hot water heaters for every size family and budget. We only sell and install quality heaters that heat water effectively and efficiently. While gas, electric and tankless water heaters are our most popular water heaters, we do sell install and service other types. Let us help you determine the correct hot water solution to fit your lifestyle and budget. While it has likely been many years since your current water heater was installed, there have been many advancements made in water heating efficiency over the years. We encourage you to ask us to explain our choice as the best hot water solution for you and your family. 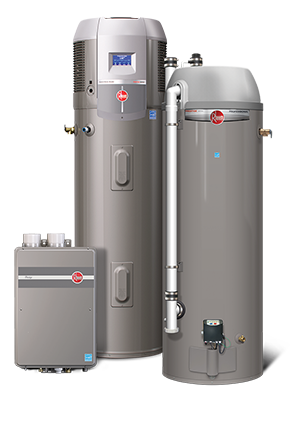 Urban Heating and Cooling is a proud supplier of Rheem hot water heaters. Rheem has a consistent track record of receiving top ratings and awards for its products, and the honor of being one of the best-selling brands of water heaters in North America. Rheem is a company that is committed to developing hot water solutions with the perfect balance of value, performance and features for every lifestyle and budget.